Poly Mailers feature a polyethylene exterior providing superior tear and puncture resistance. Great for clothing and other items not needing breakage protection. Save up to 77% over ULINE prices! All products are not created equal; they come in all different sizes, shapes, costs and materials. This is why you need to choose the right shipping products to not only keep your products safe during the shipping process, but to keep your costs down as much as possible without sacrificing quality. at eSupplyStore.com, we know the shipping world as well as anyone, and our wealth of experience means that you can hold on to your wealth by leaning on our experience to get your product safely and securely delivered to your customers. We carry an incredibly large selection of all the shipping supplies and materials you need, and all at the lowest prices possible. If quality and price aren't enough to convince you, we also have the industry's most customer-friendly service staff, so while you likely won't ever run into any problems, it's nice to know that they will get worked out quickly and to your satisfaction every single time. 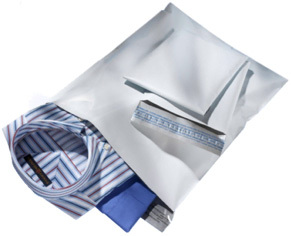 Our line of poly courier mailers below is a perfect fit for clothing, apparel and other non-breakable products. Made from superior quality polyethylene, they offer an extremely durable, water and tear-resistant material for protection, plus are so lightweight that they add virtually nothing to your shipping costs. They feature strong side seams so you can over-stuff them with impunity, and the self sealing openings for quick packing. With sizes ranging from 6x9" all the way up to 26x32" , there's a size to fit every product line you offer, and at prices that will help put some of the ink back into your bottom line. If you need any assistance with your order, or just have a shipping supplies-related question, we welcome your call at 866-437-8775 during normal (ET) business hours. We're always happy to help our customers with all of your shipping needs.